One of our most playful solitaries is Siren, a beautifully crafted and customizable light. Preciosa Lighting has taken the clever bell shape and created a table lamp for a more personal option. Dima Loginoff is Siren’s designer. The Siren solitaire is a vivid yet mysterious lamp which brings intrigue to a space with its playful inversion of the classical bell shape. The three glass bells are layered to hide and reveal and an enchanting combination of colours and textures adds to the light’s interest. Diﬀerent illumination options mean there are always new aspects and reﬂections to discover. The design intent for the table lamp was always to keep these singular features that make the pendant so unexpected. 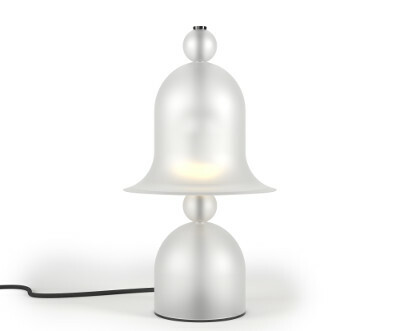 The two layers of bells give the light a special gradient of colour not often found in a typical table lamp. Like the sirens used to lure the sailors, these lights tempt with different hues - a romantic burgundy, a luxurious amber, a playful pink. The lamp can also be customized with clear or frosted glass which again creates a different atmosphere. Frosted glass gives off a softer glow while clear offers a clean minimalist feel. The lamp’s constructive rhythm: bell-sphere-bell-sphere suits not only different interior concepts, but also personalities. With its postmodernism, funky vibe we believe it will find a happy place in contemporary spaces the world over.